Global equity markets pushed decidedly lower as trade tensions continued to weigh on sentiment. Oil prices continued to weaken, as they reached their lowest level in over a year. The S&P 500 Index suffered its worst Thanksgiving-week result in seven years, down 3.8%, as all of the eleven underlying sectors turned in negative results. As of Tuesday’s market bottom, all of the so-called FAANG stocks (Facebook, Amazon.com, Apple, Netflix, and Google parent Alphabet) had entered a bear market, or off more than 20% their highs. 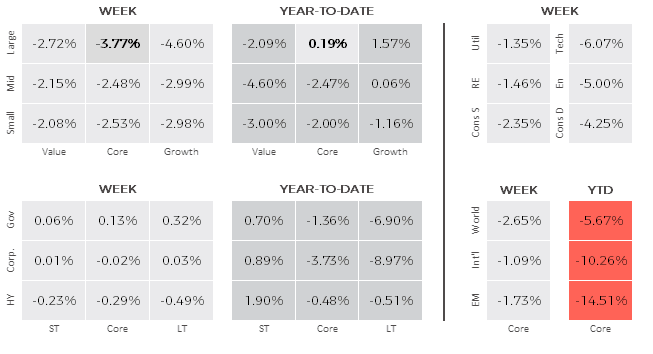 In the end, small cap stocks outperformed large cap while value bested growth across the market capitalization spectrum. Utilities, real estate and consumer staples stocks held up best, while technology, energy and consumer discretionary stocks lagged. Energy stocks were dragged down by a continuing tumble in oil prices, which reached their lowest level in over a year. Developed non-U.S. markets, as measured by the MSCI EAFE Index, held up best as Brexit fears and Italy’s budget standoff with the European Union (EU) continued to unsettle markets. Emerging markets, as measured by the MSCI Emerging Markets Index, fell 1.7% led by weakness across much of Latin America. Markets in mainland China and Hong Kong slumped on Friday following a report that the U.S. government was lobbying its allies to avoid buying equipment from Chinese telecommunications equipment maker Huawei Technologies, citing security concerns. The benchmark Shanghai Composite Index sank 2.5% on Friday, its biggest percentage loss in a month. The yield on the benchmark 10-year Treasury fell sharply from 3.08% at the end of trading the previous week to 3.05% at the close Friday. The decrease in yields pushed bond prices higher, especially for longer-term Treasuries that are particularly sensitive to interest rate changes. Credit markets struggled amid general equity market turbulence and elevated concerns stemming from energy price disruptions. Two anticipated events that investors will be focused on for clues about the pace of rate hikes and trade negotiations are a speech by Fed Chairman Powell to the Economic Club of New York on Wednesday and the G20 summit that runs Friday and Saturday.